The Basilica of the Sacred Heart of Jesus in Cracow is an important centre of Blessed Father Beyzym cult. In 1898 Father Beyzym left the city for Madagascar to take care of the lepers in the following fourteen years. Before living for Madagascar, he visited Carmelite sisters in Wesola, Kopernik Str. and in Lobzowska Str. He made friends with them and they became the prayer background for his missionary service. The nuns of both Carmelite Convents preserve the letters written by Father Beyzym himself with piety. “My chicks celebrated retreat. It was not an easy process but we managed somehow. We are still learning the catechism by applying it to every step of our everyday life, i.e. they learn it by heart and I try to explain them everything as good as I can. I keep on telling them that they should implement the learnt into actions, otherwise everything will be in vain. Thanks God, although very feebly, my black birds try to leave the earth and raise their hearts to Heaven. I also started to notice the changes in their morality for the better - thanks to Our Holy Mother. It is She, who causes those changes to happen. And thanks to my dear Mothers, due to whose prayers She causes that”. Father Jan Beyzym died on October 2, 1912 in Marana, Madagascar, in the opinion of holiness. He was a well-known figure among Polish people in all three occupation zones. The breakout of the First World War in 1914 and then the Second World War, which was much more cruel and atrocious, postponed the beginning of his beatification process for many years. On December 17, 1984 the canonical investigation with regard to Father Beyzym’s life and holiness was opened at Metropolitan Curia in Cracow (it was brought about by Cardinal Franciszek Macharski) and then in Fianarantsoa, Madagascar. Father Czeslaw Drazek (died in 2009) was the vice-postulator of the process. 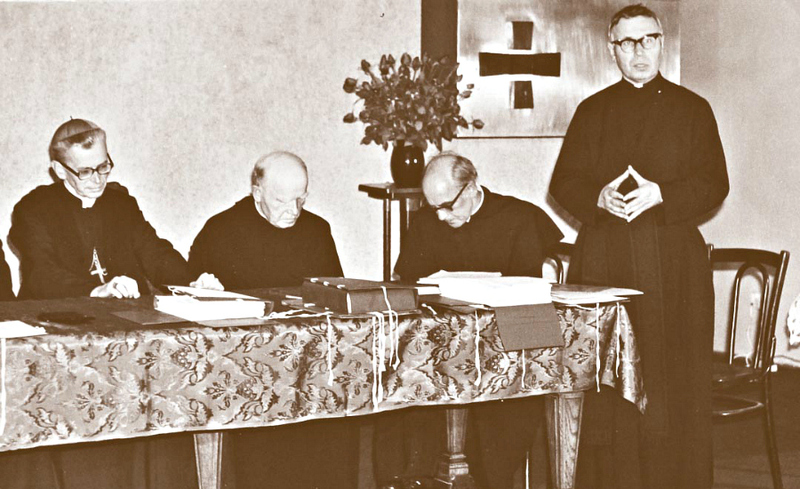 The closing of the process was on June 6, 1986 at Collegium Ignatianum at 26, Kopernik Str. in Cracow. 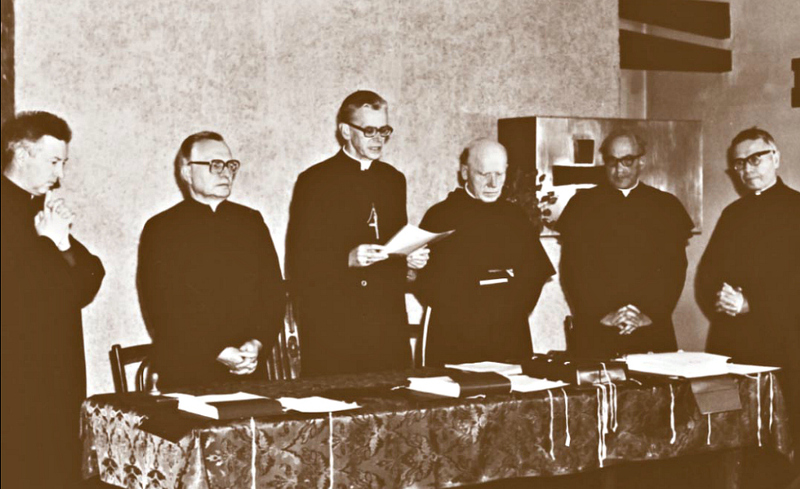 The Decree of the Congregation for the Causes of the Saints, testifying the Heroic Life and Virtues of the Servant of God Father Jan Beyzym SJ was announced in the presence of John Paul II on December 21, 1992 in the Vatican Consistory Hall. Cardinal Priest Franciszek Macharski closed the canonical investigation super miro in Cracow Archdiocese on March 13, 2002 related to a young man’s miracle recovery attributed to the Servant of God Father Jan Beyzym’s intercession (the young man was injured in a car accident in 1997). The documents, gathered for the beatification process, included witnesses’ testimonies, doctors’ opinions and other required papers. They were submitted to the Congregation for the Causes of the Saints in Rome for the further analysis and consideration. 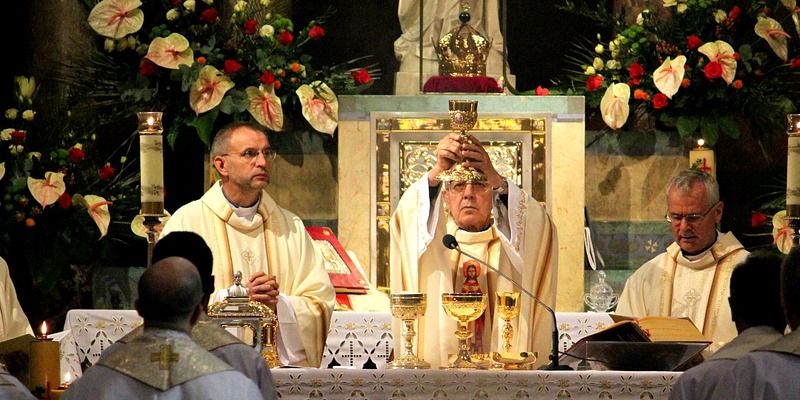 The Holy mass for the prompt beatification of the Servant of God Father Jan Beyzym was held in Cracow Basilica of the Sacred Heart of Jesus every second day of the month at 3.30 p.m. The faithful prayed ardently to Our Lord and asked Him for the indispensable graces with the intercession of the Servant of the lepers. They prayed at his relics - the bones of his right hand, with which he blessed being a priest, bandaged septic wounds and wrote letters. The members of the Association “Friends of the Lepers”, who currently provide the assistance to the leper colonies in Madagascar and India, joined energetically and enlivened the prayers for Father Beyzym’s beatification. The Association representatives read the Gospel and the prayer of the faithful. They also read the fragments of Father Beyzym’s letters. 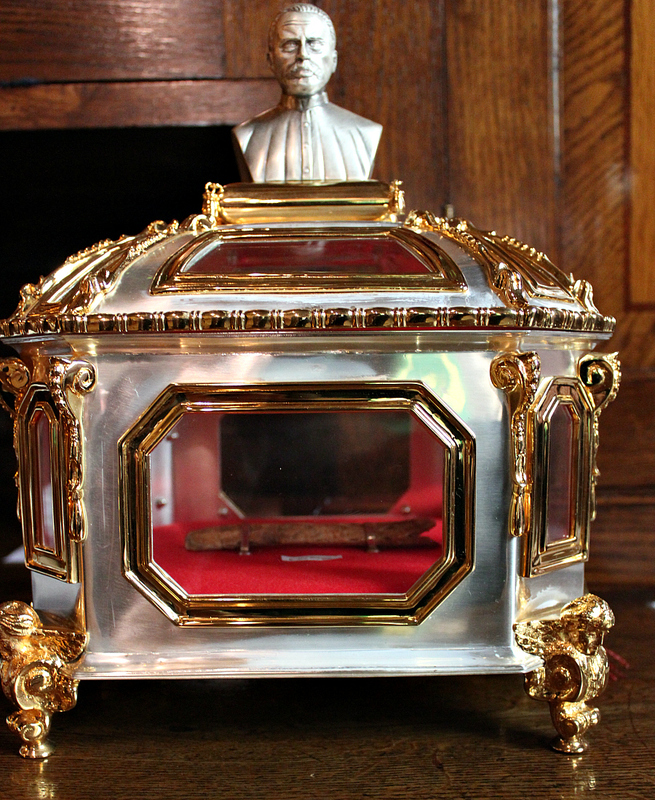 The relics of the Blessed are in a palisander chest made on Madagascar. 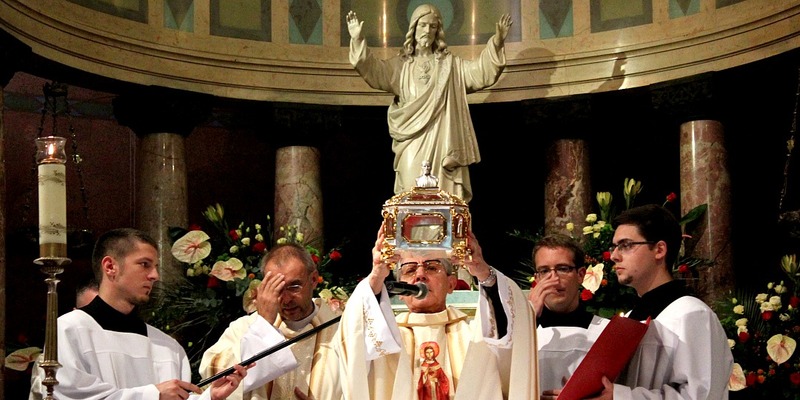 The relics were brought to Poland on December 19, 1993 by Father Mieczyslaw Kozuch SJ, the Provincial of the South Poland Province of the Society of Jesus at that time. 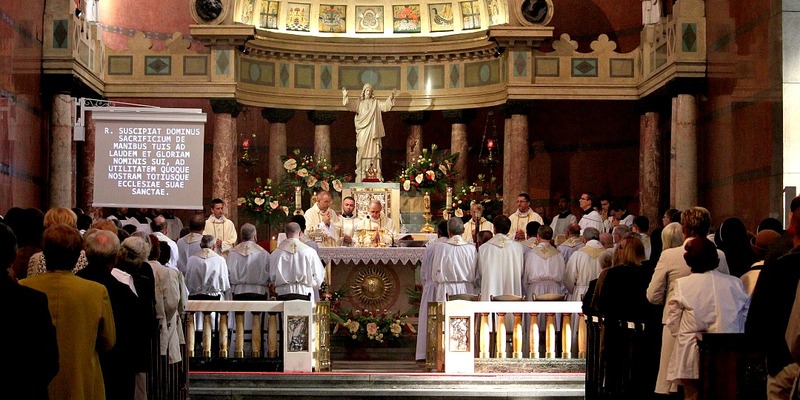 The relics were enshrined at one of the columns of our basilica on October 2, 1994. 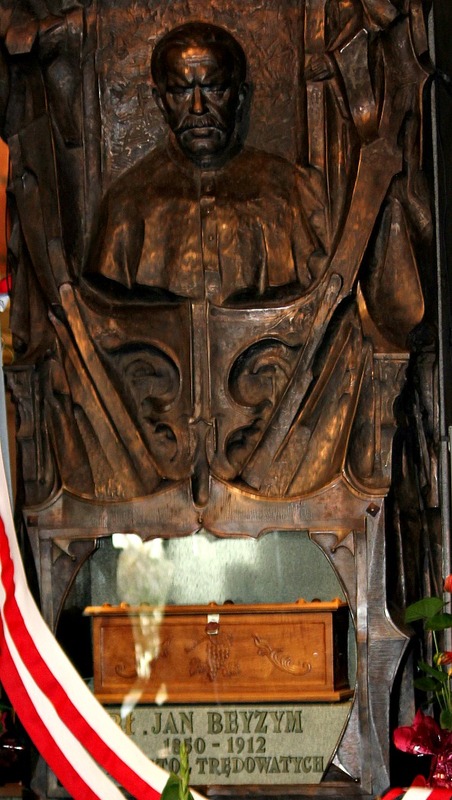 There is a base relief of the Red Island Missionary made by a local sculptor Czeslaw Dzwigaj. 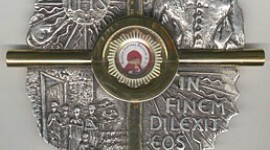 The base for the epitaph is decorated with the bronze relief, which shows Father Beyzym among his supervisees. The relief was based on the original photograph. The palisander chest is seen through the armored glass. After the exhumation, the mortal remains of the Blessed were enshrined in the marble sarcophagus in the chapel built and decorated by Father Beyzym in Marana, Madagascar. 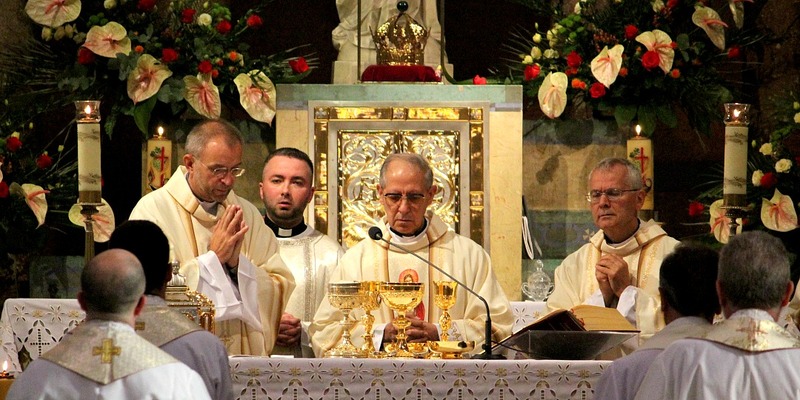 All the faithful experienced the great joy, when Father Beyzym was beatified by John Paul II on Cracow Blonia. He said: “The desire to bring mercy to the most needy led Blessed Jan Beyzym - the Jesuit and great missionary - to far-away Madagascar, where for the love of Christ, he dedicated his life serving the lepers. [...] I am glad that the spirit of sympathy in mercy is still alive in the Polish Church and the proof of it is the assistance for the natural disasters victims in different parts of the world”. In our basilica, at the sequent beatification anniversary, we gave thanks to Our Lord for the great gift for the Society of Jesus and the Church of Poland. After the concelebrated Mass there was a concert of classical music. We prepared the Servant of the lepers 100th death anniversary celebration in our basilica as well. Father General of the Society of Jesus Adolfo Nicolas SJ presided the concelebrated Mass in our basilica on Saturday, September 30, 2012. After each Holy service that Sunday the members of the Association “Friends of the Lepers” spoke to the faithful about the outstanding personality of Father Beyzym. They also informed about their activities with regard to leprosariums in India and Madagascar. On October 12, the day of Father Beyzym’s Memorial, the 6 p.m. mass was preceded with the hourly Vigil, prepared by the Jesuit clergymen in the intention of the consecrated persons. There was a concert of a famous guitar player Jan Oberbek (classical music) at 7 p.m. The musician played the piece of music composed to honor Blessed Father Beyzym. 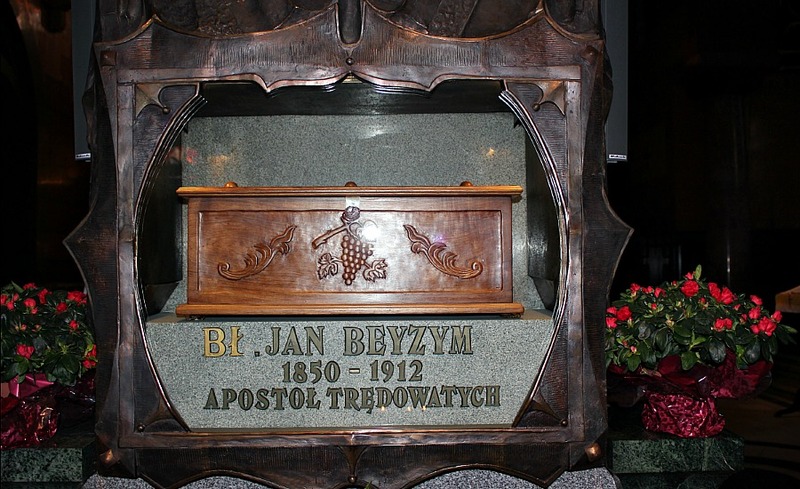 At present, every second day of the month, at 3.30 p.m. at Cracow basilica the Holy service is held for Father Beyzym’s prompt canonization. The life and personality of the great Polish missionary is portrayed in the sermons of the mass. Studying the vicissitudes of his life, we see how the Word of God bore the fruit of mercy in his life and activity.